Steve King represents Colorado State Senate District 7 which includes Mesa County and part of Garfield County. Tell Senator King what issues matter to you! Steve grew up in a small rural town in Michigan, the son of a pharmacist and small business owner. Mom was a nurse, and taught nursing at Kellogg’s College in Battle Creek. King has lived on the Western Slope since 1977 obtaining his Associates Degree in Criminal Justice and a Bachelors degree in Psychology from Mesa State College in Grand Junction. In 1980 King started his Law Enforcement career working as a patrol officer and later an investigator for the Grand Junction Police Department. In 1999, Steve served Mesa County Sheriff’s Office as an Investigator for the Complex Crimes Unit. This unit was responsible for the investigation of homicides, sexual assaults, and other serious assaults. During Steve’s time at MCSO, he was one of the lead investigators on the Blagg double murder case, and was instrumental in helping convict Michael Blagg. This included 5 days on the witness stand and 54 hot summer days (average temp. 97 degrees) searching the Mesa County landfill. King is still an active Deputy for Mesa County. With over thirty years of Law Enforcement experience with The Grand Junction Police Department and The Mesa County Sheriff's Office Senator King brings those unique life experiences to the Colorado Senate. 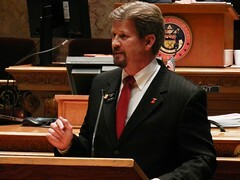 Senator King is the only active Law Enforcement Officer / Citizen Legislator in Colorado. More information about Senator King can be found at www.VoteSteveKing.com.